For nearly a century, promising writers, many of whom have gone on to be well-known for their work around the world, have called Iowa City their home at some point in their life. It should come as no surprise that in 2008, this beacon for the written word was designated as a City of Literature by UNESCO Creative Cities Network, the first in the United States. 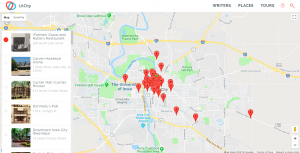 Since that time the Iowa City UNESCO City of Literature organization in conjunction with the University of Iowa has been engaged in the development of the LitCity project. 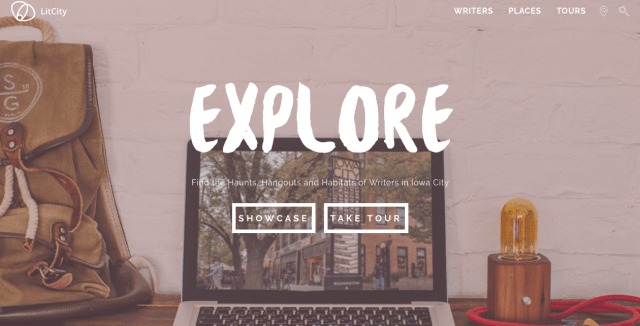 The LitCity project is a digital library and website which features and highlights important Iowa City literary landmarks, including locations where writers lived, worked, gave readings, socialized and were inspired by the town. 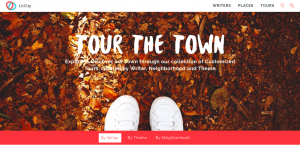 The site comes equipped with a mapping component for users to pinpoint certain locations in town where these writers spent time writing and socializing in town. 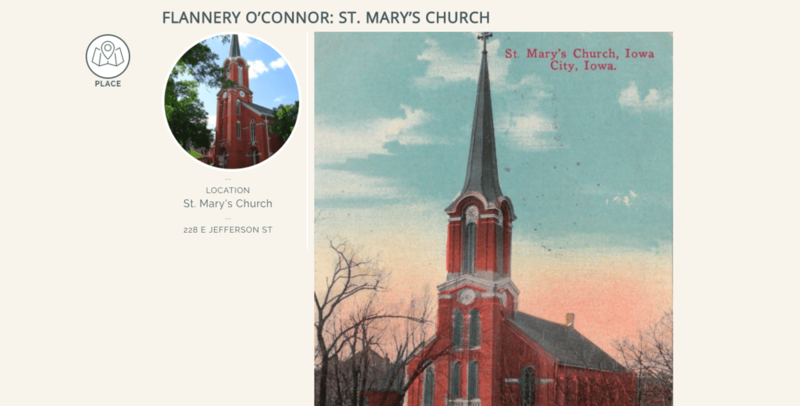 This technology allows you to locate places such as where Kurt Vonnegut resided while living in Iowa City, or how Flannery O’Connor considered St. Mary’s Church on East Jefferson Street a home away from home. Essentially, LitCity takes us on a virtual tour of the town, while getting to know a little bit more about the lives of these literature icons. 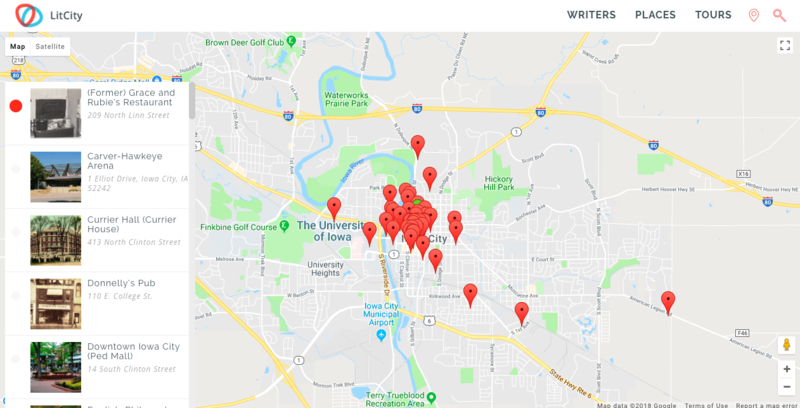 Using Iowa City as a local level phase of the project, the team behind LitCity hopes this will act as a framework for other literature hubs around the world, are able to customize the app to allow visitors and residents to explore some of the haunts of hangouts in their area that writers have spent time in. For instance, Dublin, Ireland might install the Web-App system and customize it for their own cultural industry and — utilizing the research framework and toolkit developed in the initial phases at the University of Iowa — create their own site-specific map for the humanities-based points of interest of their specific community. Guests in Iowa City this week taking part in the 2018 Annual Meeting of the UNESCO Cities of Literature will be among the first users of the new LitCity project as they explore literary Iowa City during their stay. 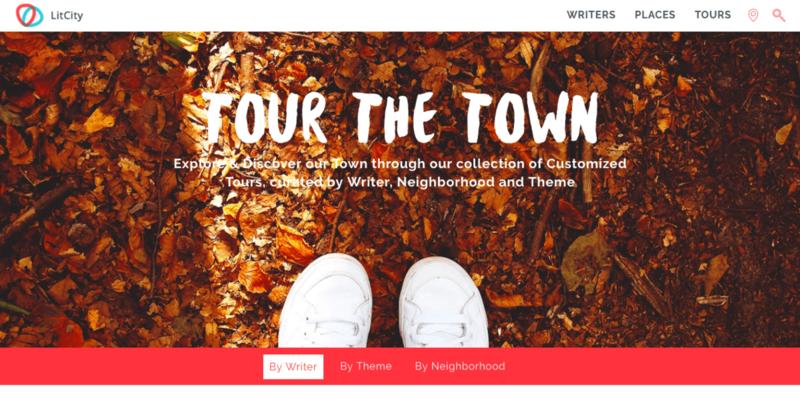 So whether you live in the area currently, have visited, or have never even stepped foot in the Corridor, LitCity wants to enrich the knowledge of your surroundings and take you on a virtual walk through the places that shaped these writers’ work and maybe even inspire you to get started on that novel! This summer the Studio will pilot a new fellowship program with the help of the University of Iowa Graduate College and the Studio Steering Committee. 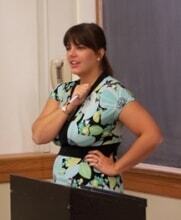 Nine current graduate students have been named Summer Studio Fellows. The students will soon take part in an 8-week course that provides mentored digital scholarship experience, as well as training in skills and tools they might use as they pursue innovative ways of thinking about and sharing their creative endeavors. Below you can read more about new fellows and a description of their proposed projects. 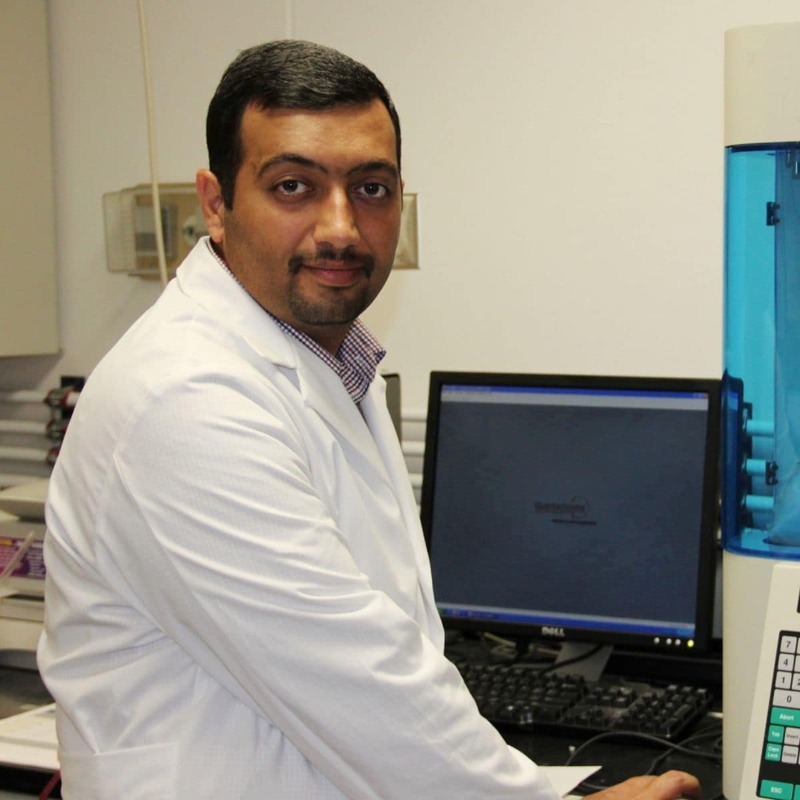 Currently working on a PhD in the Chemical and Biochemical Engineering department, Hayder Alalwan will continue work on a project started in the Spring of 2014. He will explore the creation of a website to publicly share information on chemical looping combustion (CLC). That process process uses the lattice oxygen molecules of metal oxides to decompose the gas, instead of air, which minimizes formation of pollutant byproducts such as NO2, N2O, or NO, which form when the reaction occurs in air (e.g., N2 and O2). In addition, the CLC process is highly efficient at decomposing gas with little to no side reaction. Hayder’s work will help bring his research findings to a broader public as part of his work in science communication. Alexander Ashland plans to expand on his work of Mapping Whitman’s Correspondence, integrating new data into an existing database, dedicating time to revisiting the existing prototype, and exploring the possibilities for implementing crucial features, such as search functionality, timescale manipulation, dynamic proportional symbols, and filterable keywords. Ashland’s current data has been gathered from the Civil War, Reconstruction (1867-1876), Post Construction (1877-1887), and Old Age (1888-1892) eras. Sonia Farmer plans to launch a podcast that shares the rich world of Caribbean literature. The podcast will provide Caribbean writers with a platform share their writing, and grant people easy access to a multitude of voices. Farmer comes to us from the UI’s Center for the Book to hone her digital editing skills and develop the platform. 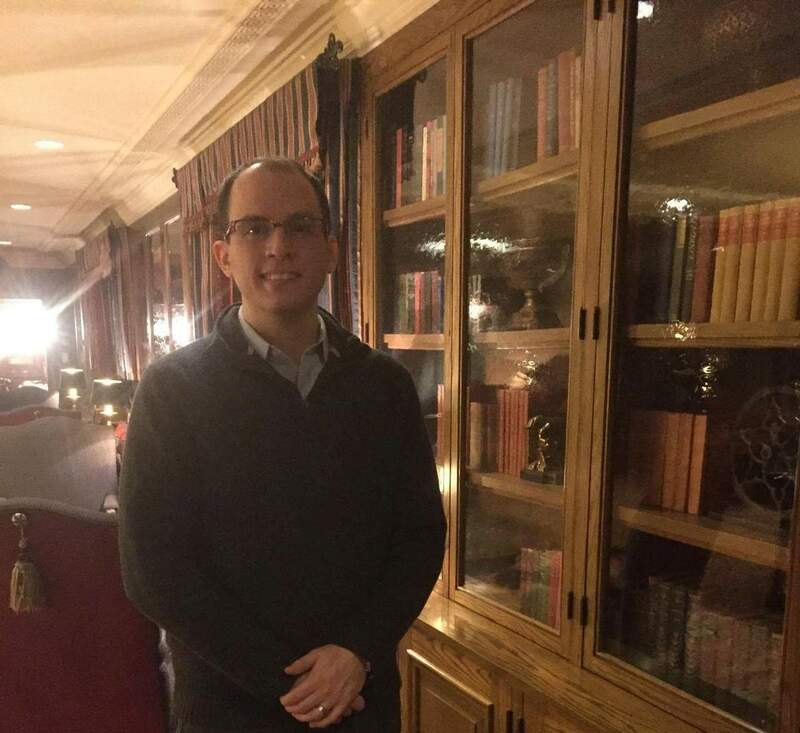 Andrea Lakiotis will explore online digital publishing while engaging with translation theory and practice. 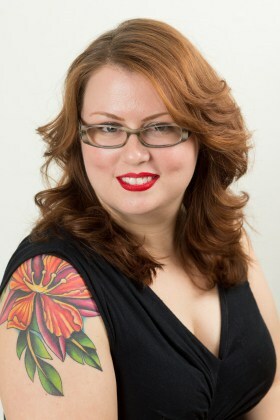 She brings experience in digitizing data, mapping, and code to the digital translation work she will be doing with the Studio. Classics student Caitlin Marley plans to analyze Marcus Tullius Cicero’s corpus through computing algorithms by using his orations and social network. With this information she will map the “emotional plot” of the orations as well as the networks across space and time. Ben J. Miller studies the educational needs of pediatric patients and their families. Efficient and effective education plays a large part in regard to their care. 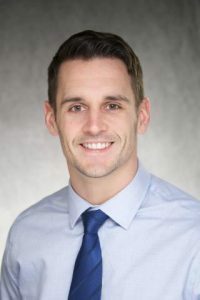 This summer, Ben will refine his digital design skills in service to educating parents on using distraction to help their children cope during painful medical procedures. Ben is designing an infographic for use in pediatric waiting rooms that demonstrates how to harness the power of their smartphones and tablets for distraction. 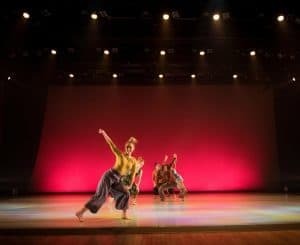 As an MFA student in Dance Performance, Arianna Russ explores the integration of digital media into her artistic work. 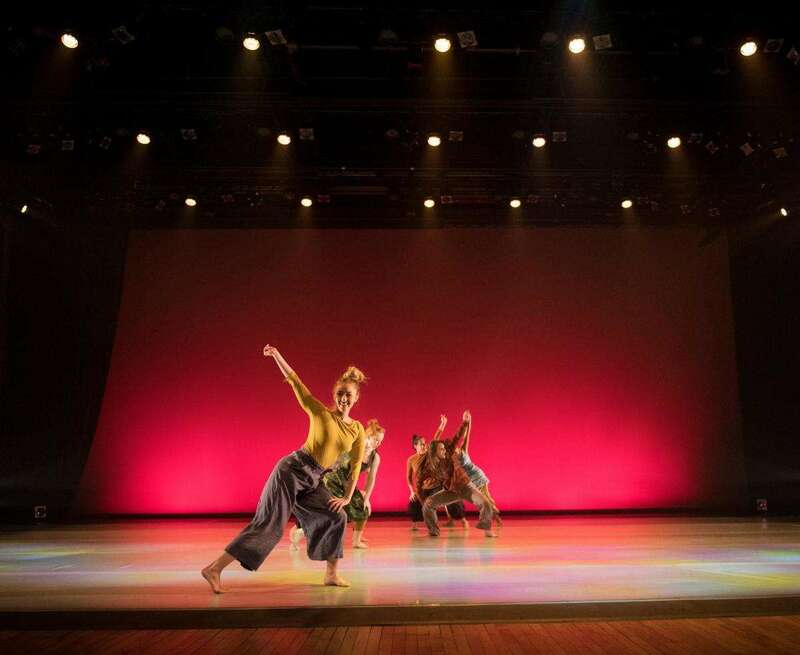 In collaboration with Dance and Theatre Arts Assistant Professor Dan Fine, Arianna will deepen her understanding of motion capture and digital artistic practice. 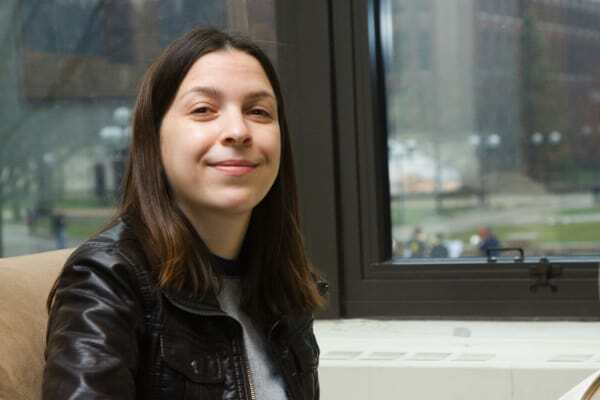 As a doctoral candidate in the department of English, Katherine Wetzel plans to continue her work on Met-Memory that she is currently constructing as part of her Studio Scholars Initiative. This project examines the tensions within local, national, and global expressions of Britishness as they occur in late-Victorian literature. The summer fellowship will also provide her with opportunities to explore the place of theory within the digital humanities. 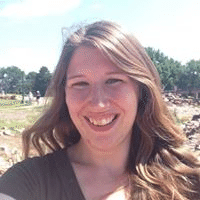 A PhD candidate in the History Department, Mary Wise plans to construct an interactive and publicly accessible map that examines the American Indian earthwork excavations in the Upper Midwest between 1890 and 1930. With training and support from Studio staff, she sees this project leading to the creation of an all-digital history dissertation. Last week the Alliance of Digital Humanities Organizations notified presenters of their acceptance to its massive annual conference, DH 2017. Held in Montreal this August, the conference brings together digital humanists from around the world to share their work. We’re excited to announce that four Studio staff will be among those UI faculty and staff presenting their work! Here’s a short run-down on who’s presenting and what will be discussed. Placing Segregation is a new open access digital project that explores research questions about housing segregation and socioeconomic disparities across nineteenth century American cities through interactive maps and interpretations. Rather than using aggregate data collected at city ward levels to make inferences about past urban geographies, this work has combined city directories and period advertisements with census records to rebuild historical address systems and geolocate every possible family in the 1860 census for the cities of Washington, D.C., Nashville, Tennessee, and, for the 1870 census, the city of Omaha, Nebraska. Mid-nineteenth century census records contain extensive details which were not collected in subsequent decades, so these geolocated individuals provide rich new datasets for historical researchers. This paper introduces core functionality of the digital exhibit (e.g. using the interactive map or its search to access information about individuals) and also explains the process of developing the data and the website. Coffee Zone: Del cafetal al futuro/ From the Coffee Fields to the Future documents a vanishing dialect of Spanish spoken in the mountainous coffee growing regions of Puerto Rico. Currently consisting of over 600 short video clips in 16 topical categories, the site can serve as a template for other researchers who are documenting similarly endangered languages or dialects in other parts of the world. The poster will present the progress and challenges of this digital humanities project, how it acts as a resource for scholars and students in a wide variety of disciplines (ecology, horticulture, psychology, and obviously linguistics, just to name a few), and the upcoming features we are working to implement. Petronius’ Satyricon and James Joyce’s Ulysses are big books that are too often cast as things to be conquered or “done” rather than encountered as portals to better understanding ourselves and the world in which we live. In this long paper, we offer an alternate approach to reading texts in which the experiential learning advocated for by John Dewey (and often averred by literary theorists) is combined with a host of digital mapping tools, broadly understood. We describe our work in two courses—one in Classics and one in English—as aimed at connecting the content of Petronius’ and Joyce’s novels with the daily lives of our students. In our courses students undertook a kind of “quotidian reading” in which they identified spaces and practices in the novels and relocated those elements in their own lives, sharing their observations through mapping, blogging, and podcasting. Congratulations to everyone else who will be presenting their findings this summer. We hope to see you there! 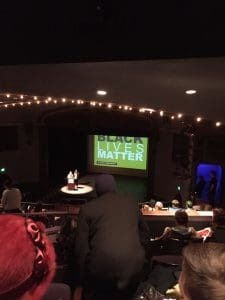 This past week I had the opportunity to attend a lecture at the Englert Theatre featuring Patrisse Cullors, co-founder of the Black Lives Matter movement. Cullors’ activism was, in part, fueled by the final verdict of the State of Florida vs. George Zimmerman case. The controversial trial ended with George Zimmerman being found not guilty on all counts of second degree murder for the fatal shooting of Trayvon Martin. In response, Cullors and others took to social media, proclaiming: “let’s take these three words and let’s start a movement.” The Black Lives Matter movement continues to combat racial injustice and call for the implementation of increased accountability within law enforcement practices. Thoughout her talk, Cullors expressed the importance of organizing at local levels as a means of creating a national and global movement. Her call to action and to the lessons of the past reminded me of two particular instances in Iowa’s past, where bold men and women have spoken out against injustice. Patrisse Cullors speaking at the Englert Theatre on February 6, 2017. Edna Griffin photographs. 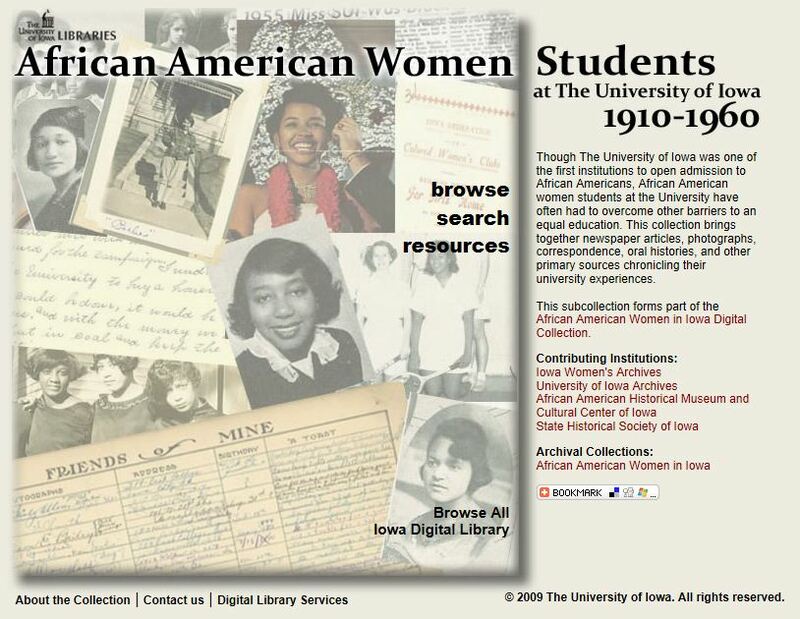 Iowa Women’s Archives, University of Iowa Libraries. 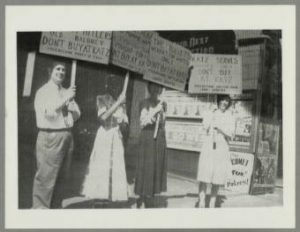 These stories are two of many archived in the Iowa Digital Library and the Iowa Women’s Archives, and they invite us to look back on our history and the role Iowans have played in defending civil liberties. With Professor Amanda Visconti in town this week as part of the University of Iowa’s NEH Next Generation Humanities Ph.D. Planning Grant, I wanted to reflect on the importance of her Infinite Ulysses project for literary study in general and Joyce studies in particular. 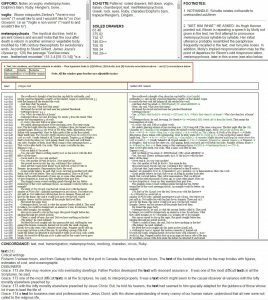 In 2015, Amanda Visconti did something that many Joyceans had often considered but never fully realized: she invited the public to annotate a public, web-based, and full-text version of James Joyce’s Ulysses (1922). For decades, scholars had struggled with the notoriously irascible Joyce estate and its policing of copyright, access, and articulation where Joyce’s writings were concerned. The past thirty-plus years are littered with wonderful projects—some digital, some not—that bear the strain and scars of policy and litigation. By 2012, however, Joyce’s novel could now circulate in ways that its author (arguably) had hoped it would. That year, Ulysses exited copyright and returned anew to the welcoming embrace of the public—a public that is its subject; a public for whom it was written; a public that can now in turns, be informed by and inform the text. 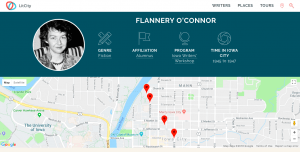 When Amanda Visconti, as a graduate student, began work on her project, she entered into a long line of digital projects that sought to remediate aspects of Joyce’s work. Some of these projects were annotative in nature; others sought to echo the experimental aspects of Joyce’s writings. In her excellent whitepaper submitted as part of her doctoral dissertation, Professor Visconti maps out a number of digital treatments of Joyce’s work. So, I won’t rehash those here. Instead, I want to call attention to her project for its public, digital focus on collaboration and community-building. There is arguably no work of literature more devoted to the idea and the practice of community than James Joyce’s Ulysses. 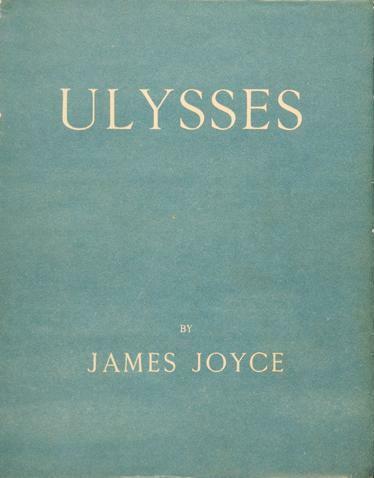 As early as Dubliners (1914), Joyce was remarking on his own “scrupulous meanness” with respect to that collection’s careful articulation of seeming banality. Joyce’s talent for translating the everyday into prose informs all of his works. And Ulysses, the story of a day in Dublin, so elegantly, so experimentally, so thoroughly captures the pulse and verve of life hiding in plain site, that Joyce boasted to his friend Frank Budgen, “I want…to give a picture of Dublin so complete that if the city one day suddenly disappeared from the face of the earth it could be reconstructed out of my book.” The line is, of course, not literally true—and today, with Dublin having undergone so many transformations, too much physical difference lies between the Dublin of Ulysses and its 21st century iteration. But I don’t think that was Joyce’s point. Joyce is, for me, our most human writer. The picture of Dublin he gives us is one informed by our pettiness, insecurities, and fears just as fully as it is our empathy, charity, and loves. Where we fail to give things a second thought—opening a door, crossing the street, pouring a drink—Joyce follows behind us, gathers up the neglected details of our everyday lives, and relocates them in this human narrative. And by virtue of reading Ulysses, we re-encounter ourselves in the text. Now, that’s a point I had to make in order to best articulate the value of what Amanda Visconti has done. For years, people have created reading groups around Ulysses and Finnegans Wake. Those texts nearly necessitate and certainly support a multiplicity of perspectives. Joyce’s work both turn upon and turn towards the public. We read them to better know ourselves and in reading them we create or are brought into new communities addressing those texts. 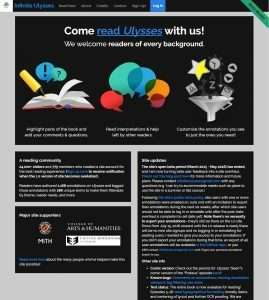 Infinite Ulysses stands as one of the most successful public digital projects that attends to the work of literary criticism via annotation while at the same time creating a community around the text. This summer, J.D. Biersdorfer, writing for the New York Times, mentioned the site in a piece about the rise of digital assistance in reading Joyce’s tome. Biersdorfer referred to the site as “a global community of readers and scholars discussing an online copy of the text together in a mash-up of literary analysis and group therapy.” I have no issue with that assessment. The creation of a vibrant community in which ideas circulate, questions are posed, debates had, and the odd or idiosyncratic view conveyed seems like precisely the picture of humanity Joyce sought to give us. A dissertation that advances both a critical apparatus for approaching (literary) works while also enacting public use of them marks, to my mind, a turning point in what we can expect from a dissertation. For me, Infinite Ulysses illustrates just how much of Joyce’s work Professor Visconti came to understand while pursuing her degree. The fact that her dissertation reaches beyond the page and into the broader public captures the essence of Joyce’s work in a way few do. Next Gen Ph.D.: A Conversation with Amanda Visconti will be held on Wednesday, October 12th at 3:30pm in the E125 Visual Arts Building. Last Saturday we hosted the first of four digital scholarship workshops here at the Studio. This workshop covered Omeka, an open source collections management platforms designed to let scholars curate collections and create narrative displays for the public. It’s a perfect tool for supporting a balance of rigorous scholarship with a public-friendly face. We use Omeka here at Iowa for projects ranging from DIY History and History Corps to individual course assignments in undergraduate classrooms in a variety of departments. Despite only having a week of registration, I was thrilled to have eighteen attendees! The class included faculty, staff, and both graduate and undergraduate students at all levels of technical experience. We blasted through a lot of material in a little over three hours, from the basics of the site structure, adding items and exhibits, and administering the site; to more advanced concepts, such as creating custom item types, exporting between installations, and mapping with Neatline. Some attendees already had some basic knowledge of Omeka, and were generous in helping their fellow attendees who had questions. The hands-on structure of the workshop, in which every attendee was tinkering in their own website, also gave people who were more comfortable with the technology the chance to work ahead and try features out for themselves. This model of people going at their own pace but tuning in when they needed to and communicating with each other was made much easier by the TILE classroom. Attendees were able to work in small groups where they could feel comfortable asking their neighbor a question, but everyone could still see what I was doing as I walked them through various parts of the site on the screens around the room. I was glad to see that everyone’s enthusiasm carried over to lunch! We adjourned to the Studio for sandwiches and chatting, and a lot of interesting conversations were going on about various research projects. People had a chance to reflect on the basics that we had covered before lunch, and bounce around ideas for how Omeka might be used in classrooms. For me, one of the most important parts of any technical workshop is explaining the overall structure and main concepts of a platform, not just the step-by-step motions of doing things with it. This has often been a difficulty for me when researching new tools, that often the documentation assumes you already understand what you might want to do with it. We had great questions about the differences between different versions of Omeka and how to decide which is best for a specific purpose, and also about how much of how a site is used and set up depends on decisions specific to a project versus field standards. It’s important to me for people to understand that there’s often not one right way to “do digital”, but that digital resources can be used differently to express what we really want to get at with our research. Registration is still open for our upcoming workshops on text encoding, 3d modeling, and mapping, so come join us! This August, traditional Fair fare such as deep-fried Twinkies, Snickers, and sticks of butter will be making room for even more old-school treats featured in the UI-sponsored Szathmary Historic Recipes cooking contest. 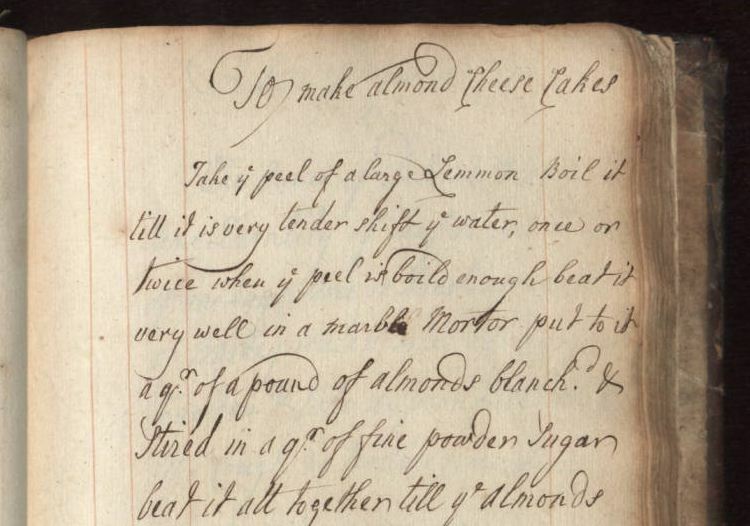 Up for recreating 18th- and 19th-century desserts like Almond Cheese Cakes, Summer Mince Pies, and Mrs. Matson’s Marlborough Pies? Unintimidated by units of measurements such as “about the bigness of an Egg” and ingredients like “Orange Flower water”? Then see contest details on page 53 of the Iowa State Fair food booklet. 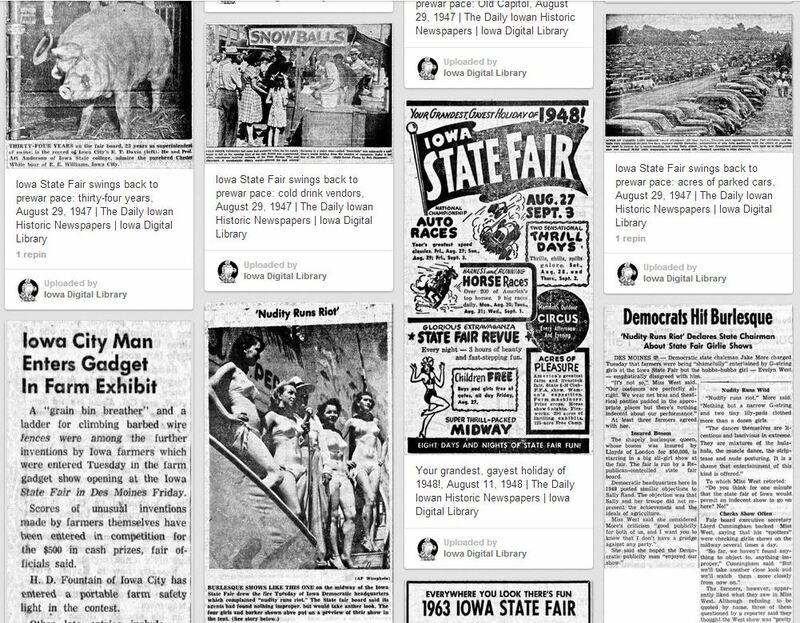 And to get in a historic mood, please visit our Iowa Digital Library Pinterest site to view a selection of digitized State Fair cartoons and clippings, ca. 1894-2004. Beginning tomorrow, a series of events will take place on campus examining the black experience at The University of Iowa. 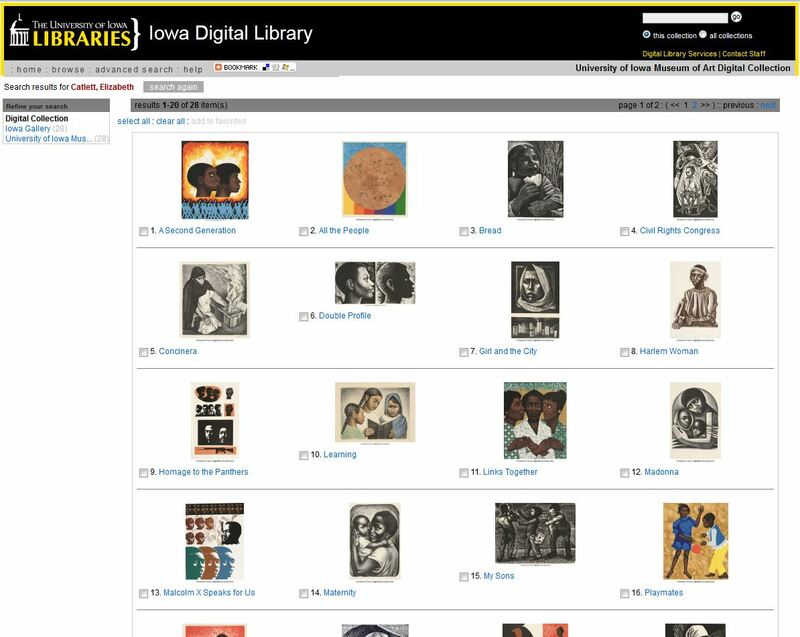 Two sessions in the “Iowa and Invisible Man: Making Blackness Visible” project have an online component in the Iowa Digital Library. Tuesday, Nov. 29, 7 p.m., Shambaugh Auditorium, UI Main Library: “Black Hawkeyes: Midcentury Memories of the University of Iowa.”What was it like to be a black individual on the UI campus in the 1950s? UI alumni will offer first-hand memories of that period. The panel will be moderated by Richard Breaux, assistant professor in Ethnic Studies at Colorado State University and author of Maintaining a Home for Girls: The Iowa Federation of Colored Women’s Clubs at the University of Iowa, 1919-1950 and To the Uplift and Protection of Young Womanhood: African American Women at Iowa Private Colleges and the University of Iowa, 1878-1928. Thursday, Dec. 1, 3 p.m., Iowa Memorial Union, Illinois Room (Room 348): “For My People: Elizabeth Catlett at Iowa and Beyond.”UI Museum of Art chief curator Kathleen Edwards will discuss the work of UI alumna Elizabeth Catlett (MFA ’40), including her sculpture Invisible Man: A Memorial to Ralph Ellison, 2003. Edwards visited with Catlett in Mexico in 2006. Subsequently, the UIMA purchased 26 of Catlett’s prints. After the lecture, the audience may view prints by Catlett in the UIMA@IMU Visual Classroom. It has been two hundred years since a book was published in England “By a Lady,” entitled Sense and Sensibility. On October 30, 1811, Jane Austen’s first novel was published, creating a literary phenomenon that continues to this day. Join us in the Special Collections reading room on the third floor of the Main Library on Friday, October 28 from 4:00pm to 5:00pm, when we will celebrate this event with an informal gathering. 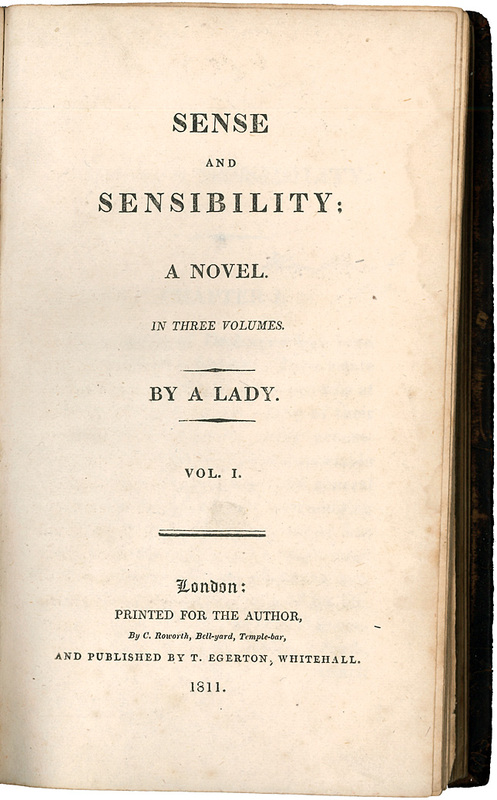 Our copy of the first edition of Sense and Sensibility will be out for viewing, along with a few other Austen pieces. End your week with some good books and good company. Karen Joy Fowler reads selections from her novel The Jane Austen Book Club. She explains how she conceived the idea for the novel while at reading at an independent bookstore. Fowler recounts how she had seen a poster on the wall that had proclaimed “The Jane Austen Book Club”, and was excited to purchase the book with that title. When she realized that the poster was for an actual book club instead of a book, Fowler knew she had to pen a book with that title. During a question and answer session, Fowler explains the format of her book–the book club in her novel covers six of Jane Austen’s works over the course of six meetings. She goes on to discuss the tendencies of the characters in her book to relate specifically to characters in Austen’s works. Fowler, who is also a successful science fiction writer, feels that she has two separate careers in two completely distinct genres. She explains that she purposely keeps her two careers “separate” so that each fan base does not feel put off by her other works. Fowler goes on to recount her own experiences in a book club, and how these experiences informed her novel. She outlines her respect for Austen and Emily Dickinson, and her awe at their contemporary style of writing. 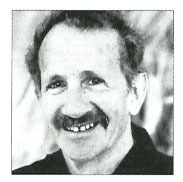 Iowa Writers’ Workshop graduate Philip Levine (57MFA), “best known for his big-hearted, Whitmanesque poems about working-class Detroit” was named the new U.S. Poet Laureate today.